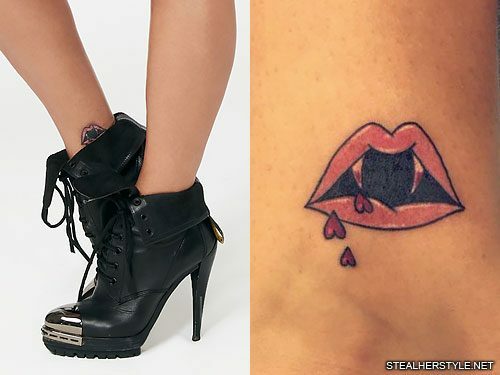 Kirstin Maldonado has a vampire-inspired tattoo on the inside of her right ankle. It’s a mouth with vampire fangs and little upside hearts instead of drops of blood. 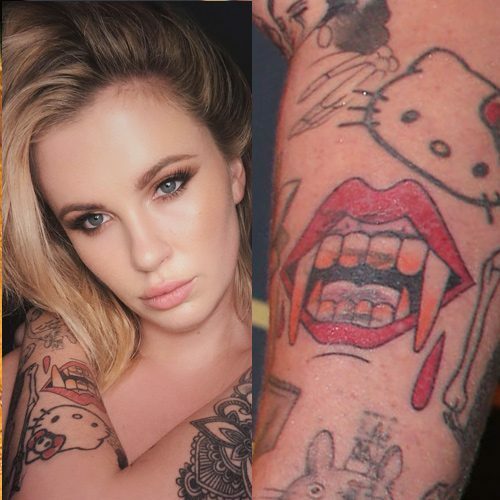 She got this tattoo as a Friday the 13th special on October 13, 2017 from artist Romeo Lacoste. 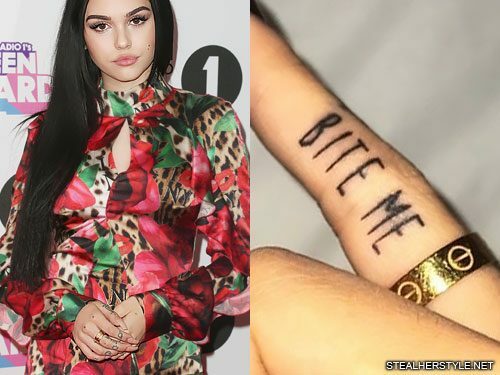 My hand tattoos, like my ‘bite me’ one, are just because I love vampires. 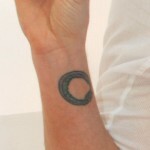 I want to get a fang tattoo, but I am just too scared to get a big artwork piece on me because I am so young still. 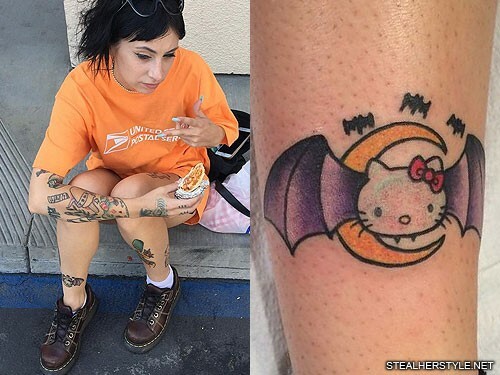 Kreayshawn attended the Los Angeles Hello Kitty Con celebrating Hello Kitty’s 40th birthday in November 2014 and got this tattoo on her calf which is second Hello Kitty tattoo, the first being the sugar skull one on her arm. This version depicts Hello Kitty as a vampire with tiny fangs and bat wings. 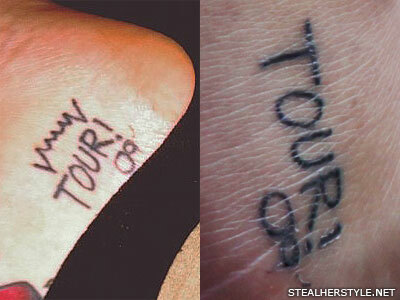 Sierra has “TOUR 09” written vertically on the inside of her left foot, along with some other worn off tattoos. 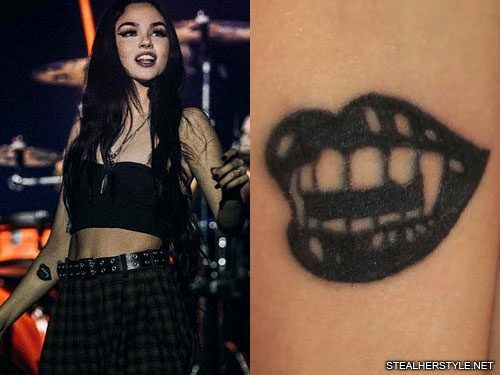 She gave this tattoo to herself while her band VersaEmerge was on the OP Tour with Boys Like Girls, Cobra Starship, The Maine, and A Rocket To The Moon in the fall of 2009. Sky Ferreira has V-shaped vampire fangs on both of her middle fingers. 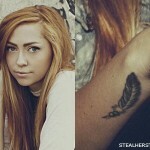 She got the tattoos on a whim while she was at a tattoo parlor with a friend. 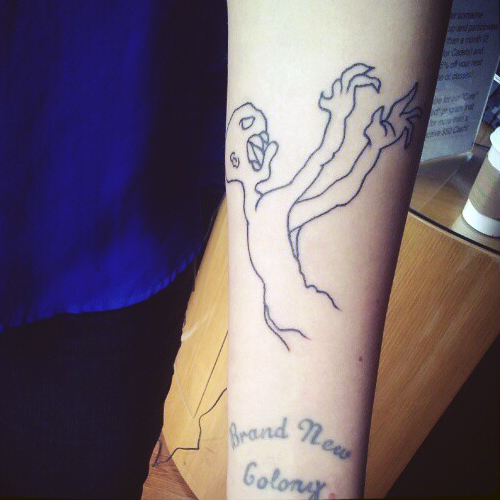 Charlotte Sometimes has a tattoo on her left arm depicting a cartoon version of the character The Master from the TV show “Buffy The Vampire Slayer.” Her wrist says “Brand New Colony” which is the title of a song by The Postal Service. 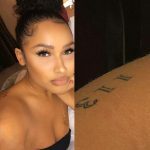 Amber Rose has a large tattoo on her left forearm which says “The World Is A Vampire.” It is a lyric from the Smashing Pumpkins song “Bullet with Butterfly Wings” and a reminder that the world can be cruel. 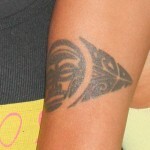 Bobby Serna inked the words in a traditional tattoo style lettering in May 2012.